Spiral galaxies are among the most magnificent objects in space. Grand and sprawling, they are icons of the night sky. 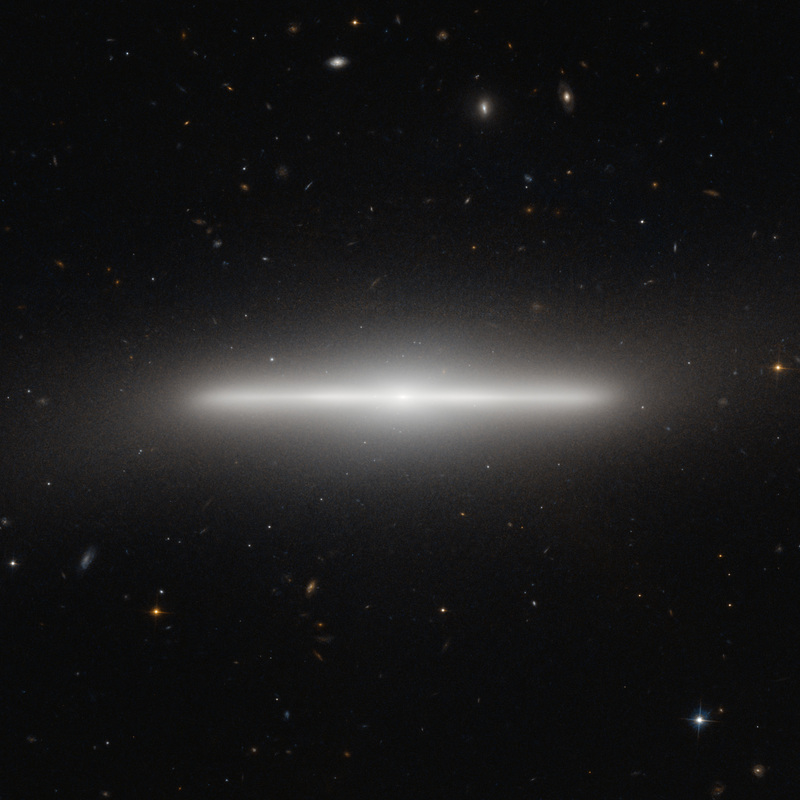 There are lots of edge-on galaxies in the sky, like NGC 253 and NGC 4710, but this one is extraordinary. The alignment is perfect, and the disk is incredibly thin. Our Milky Way is 100,000 light years across and 2500 or so light years thick (a ratio of 40:1), but NGC 4452 looks even thinner than that; measuring off the picture I get a width-to-thickness ratio of 100:1. Other things are obvious, too, and honestly a bit weird. For one thing, the central bulge of the galaxy is very small; in most edge-on galaxies it pokes above and below the disk like in NGC 4565, shown here. In that picture you can also see lots of dark dust; that’s actually complex organic molecules that are very efficient at absorbing visible light. They’re created when stars are born and when they die, and dust clouds tend to huddle close to the center of the disk. But NGC 4452 appears denuded of dust! I’ve never seen a galaxy quite so clean. I think it would actually pass the white glove test. As it happens, this galaxy is part of a nearby cluster called the Virgo Cluster, a collection of hundreds of galaxies about 60 million light years away. In between the galaxies is a thin fog of gas, and as the galaxies orbit each other they plow through this gas. The high speeds at which they travel can actually strip them of their own gas and dust, like when you open your car window while driving to get rid of, um, say, an obnoxious smell. Perhaps this is what happened to NGC 4452. The disk is surrounded by a fuzzy glow, which would be the collected light from billions of stars above and below the disk. Note that if you look to the extreme edges of the disk, the fuzzy glow appears to subtly bend down on the left and up on the right. The galaxy is warped! This is common in disk galaxies (the Milky Way and nearby Andromeda galaxies are warped, and you can also see it in NGC 5866). It’s usually caused by a gravitational torque, an off-center tug, from a nearby galaxy. Since NGC 4522 is in a cluster, it’s not too surprising there might be some galaxy that could do this. And finally, one more thing. Look at all the distant background galaxies in the picture! There are dozens of them scattered about, most much, much farther away. Mind you, this picture of NGC 4452 is a short exposure; just a combination of 12.5 minutes using a blue filter and 20 using an infrared one. This means the sky is filled with galaxies! And each one is an island Universe, made of billions of stars along with massive gas and dust clouds, and each as spectacular and amazing as this one seen up close.